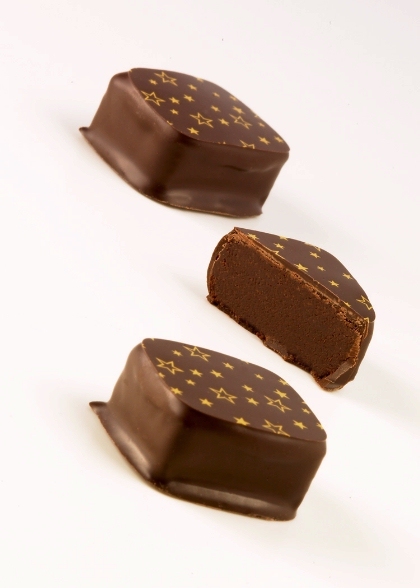 Chocolat by Daniel is handcrafted for the pure pleasure of indulging in the world’s finest chocolate. 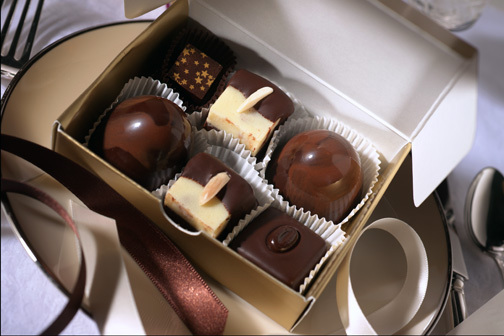 All of our European-style truffles, gourmet chocolates, specialty chocolates and desserts are made fresh to order from the highest quality raw Belgian, French, Swiss and Venezuelan chocolate. Chocolat by Daniel contains no wax, preservatives, artificial flavors, corn syrup or added sugar and doesn’t have an “assembly line” appearance. It is elegantly boxed and delivered right to your doorstep. 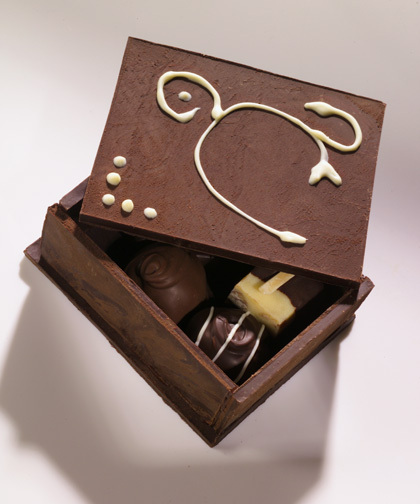 Daniel Nelson is a certified graduate of the prestigious Ecole Chocolat Professional School of Chocolate Arts in Vancouver, British Columbia and Valrhona's famous L'Ecole Du Grand Chocolat in France. 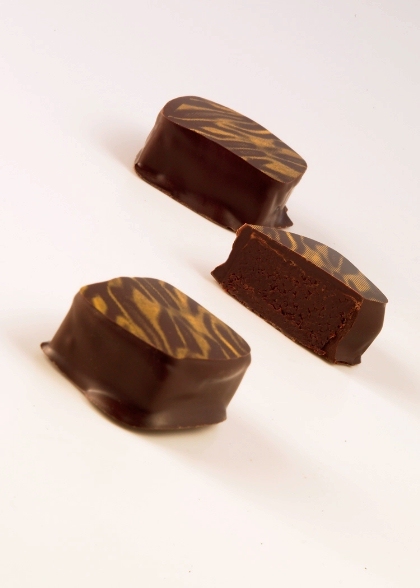 Daniel’s chocolates are made by hand from the world’s finest ingredients. They have been enjoyed in the United States, Canada, Mexico, mainland China, Japan, Great Britain, Germany, Malaysia, Australia and New Zealand. Unless noted differently, prices are $4.50 per gold box of 2 pieces or $13.00 per gold box of 6 pieces. For personal service, call 815.969.7990 or email Daniel directly. A bold liqueur sets the tempo for a dance for two in the mouth as a masculine dark chocolate coating lovingly partners with a feminine milk chocolate center. 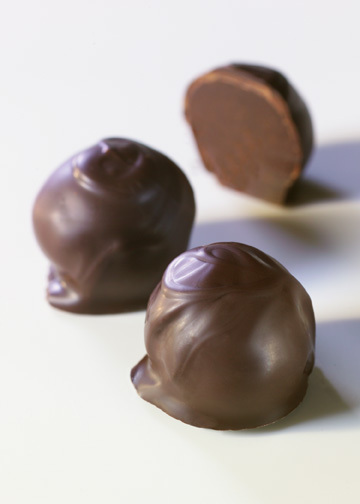 Get ready to melt with the passionately rich center of dark and milk chocolate mingling with an Italian amaretto d’amore, hidden in dark chocolate as it focuses on pleasing you. 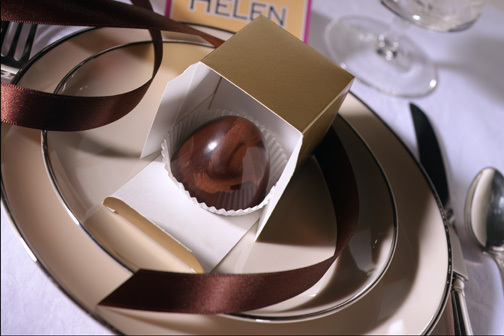 Satiny milk chocolate mingles with fine champagne essence to set the mood for an intimate celebration. Lingering memories of the morning after a night to remember. 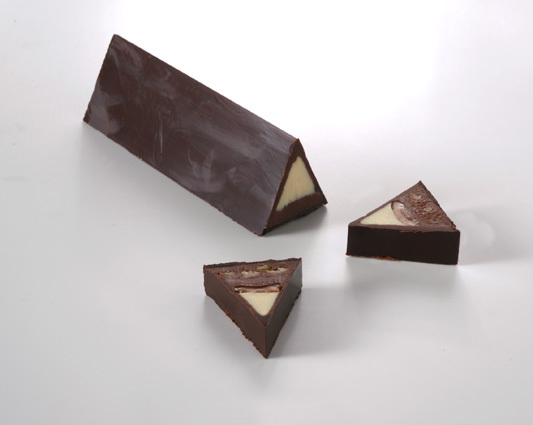 The center is a creamy white chocolate gently blended with a silky milk chocolate then infused with coffee. 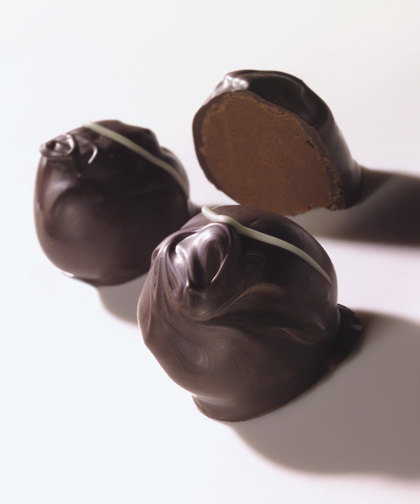 Enrobed in more milk chocolate and topped with a pure chocolate coffee bean from France. Strong, dark and potent: For those who like it aggressive, this 70% pure Venezuelan conquistador is sure to satisfy the deepest chocolate passions and longings. 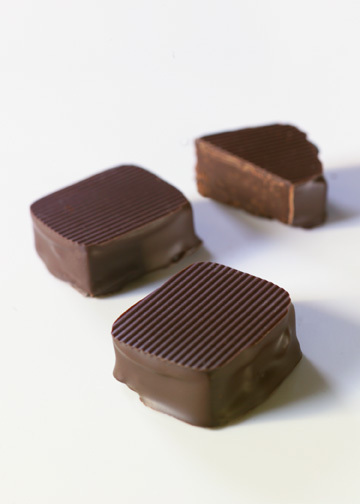 Inspired by French paving stones, the bottom layer is dark chocolate and hazelnut paste. The top layer is white chocolate and pecans. Half dipped in more dark chocolate and topped with an almond sliver. 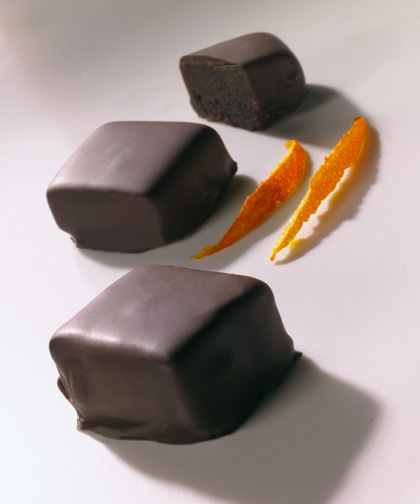 A classic pairing of dark chocolate and orange, semisweet chocolate is infused with the essence of a fresh orange before being enrobed in bitter dark chocolate. 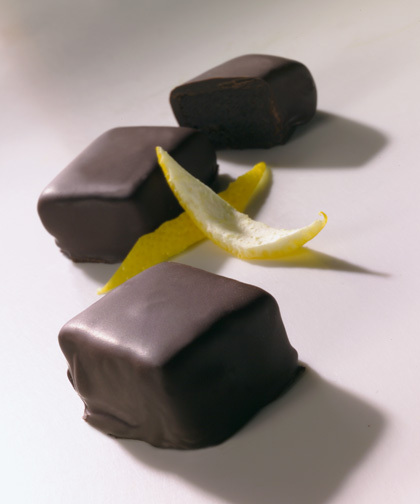 An unusual but pleasant pairing of dark chocolate and lemon, semisweet chocolate is infused with the essence of a fresh lemon before being enrobed in bitter dark chocolate. 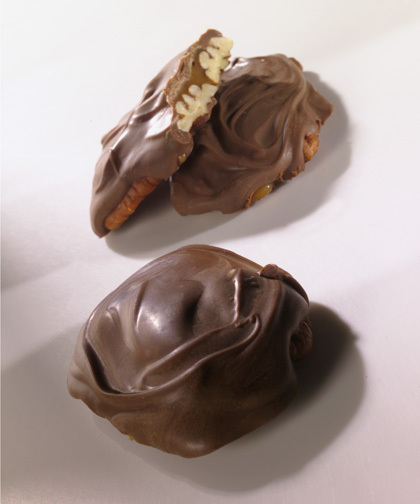 Sweet pecans and creamy Swiss butter caramel covered with silky Swiss milk chocolate. The heavenly caramel melts in the mouth and hardly sticks to the teeth. 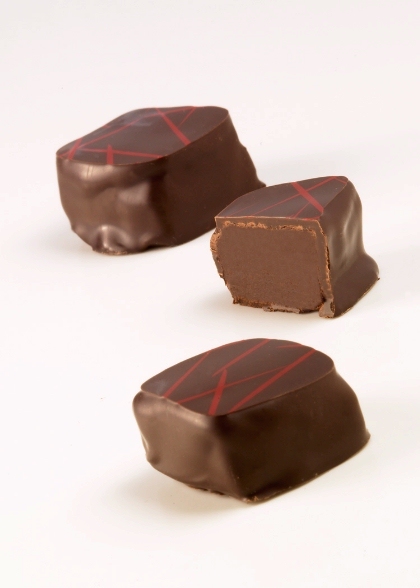 A perfect balance between superb dark chocolate and pure Italian espresso. Topped with a French pure chocolate coffee bean, your taste buds will tell you how the coffee and cacao beans were meant to be together! A mingling of threes. 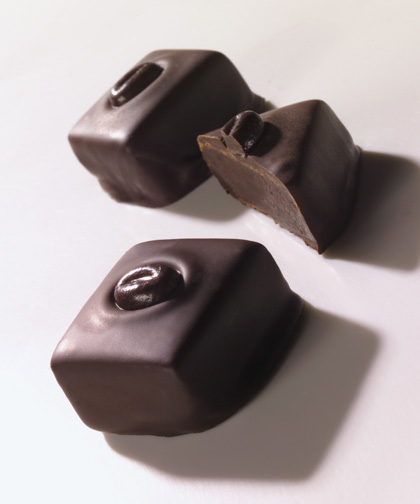 Three sides, three elements, three flavors of dark semisweet chocolate, toasted almonds and Swiss butter caramel enrobed in bitter dark chocolate. 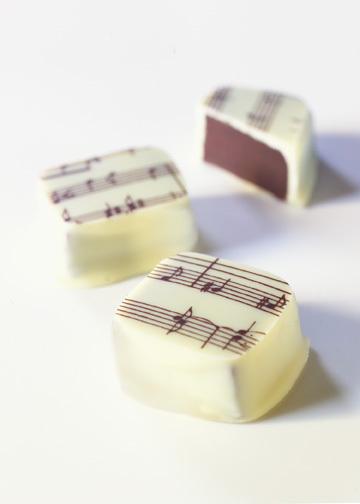 A flavor combination enjoyed by the great composer himself and served to "Court" audiences during Royal performances in the late 1700s, espresso and a mild liqueur excite a dark chocolate aria. 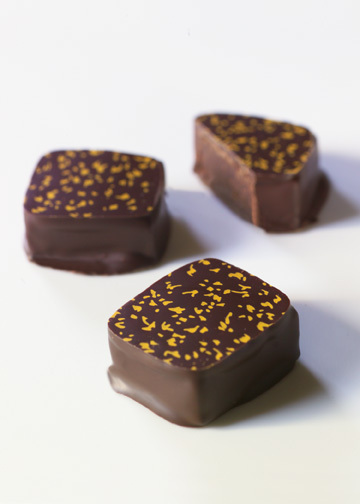 Made by the nuns of Oaxaca for soldiers and colonists in the New World, this 16th century recipe infuses dark chocolate with anise and a hint of cinnamon. 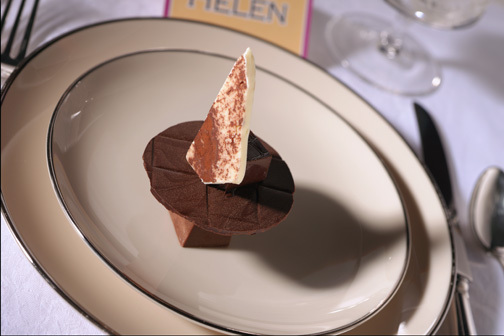 A most delicate chocolate experience was the last Grand Duke of Tuscany's favorite until his passing in 1717. A closely guarded state secret for many years, this soft, semisweet dark chocolate treat mingles jasmine with vanilla and cinnamon. 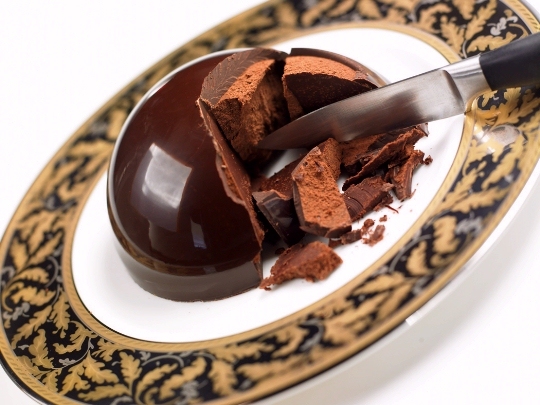 Cardinal Richelieu is said to have taken chocolate regularly to maintain his strength and health. 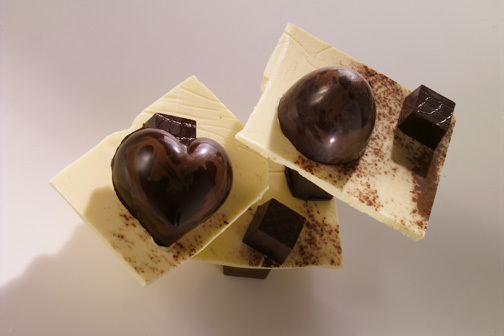 This tribute to him is a blend of dark chocolate, cloves, cinnamon, chile and vanilla. 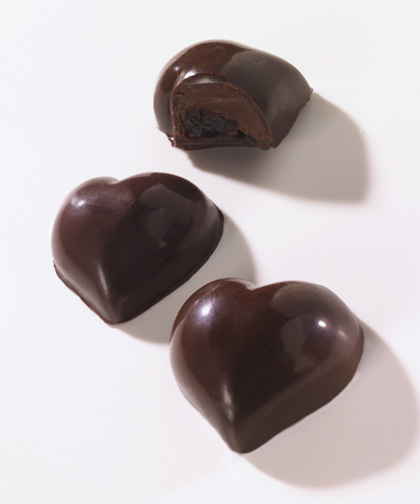 The great lover called chocolate the Elixir of Love, preferring it over champagne, and took some before each frolic. The secret recipe in this smooth yet strong treat will tease, seduce then ravish as it speaks fluently in the language of love. 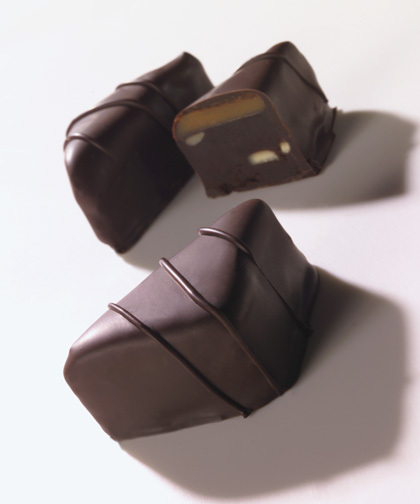 A dark chocolate shell filled with an impossibly light and creamy dark chocolate crème. 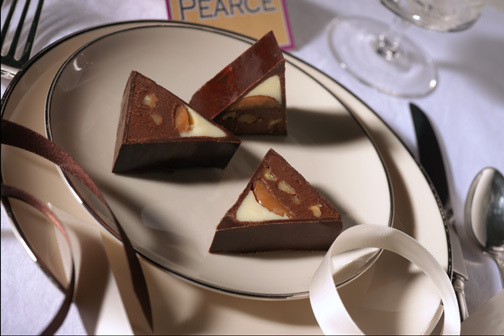 Prepare to be pampered as an elegantly marbled dark and milk chocolate shell greets you. 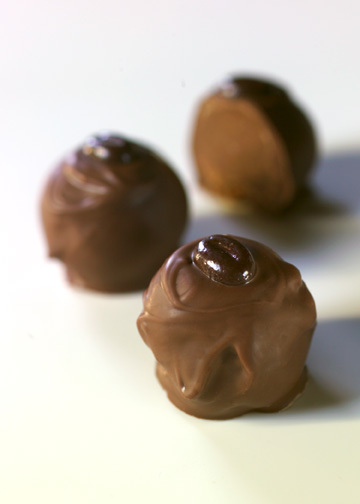 It crisply gives way and you plunge into an incredibly creamy milk chocolate center. 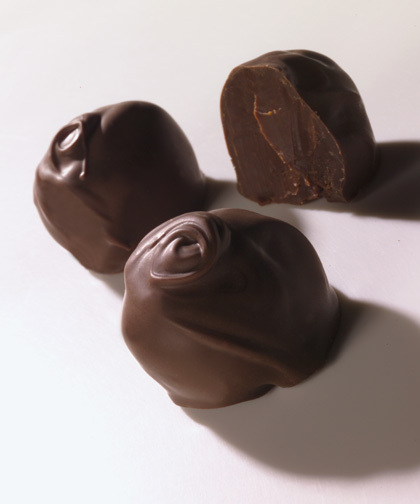 A tragically dark chocolate shell conceals creamy milk chocolate and bits of dried cherries. 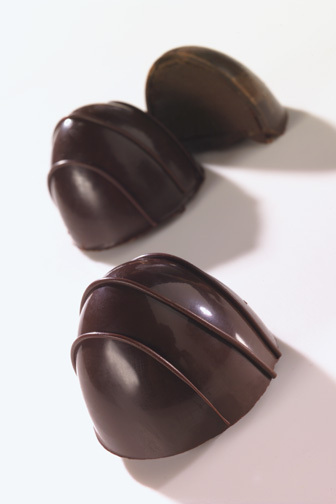 Measuring 5 inches across and weighing nearly one and a half pounds, a dark chocolate shell conceals a smooth dark chocolate ganache. 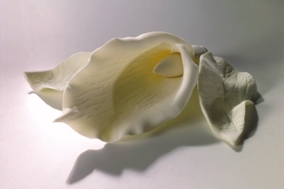 What secret passions can be revealed by moonlight? 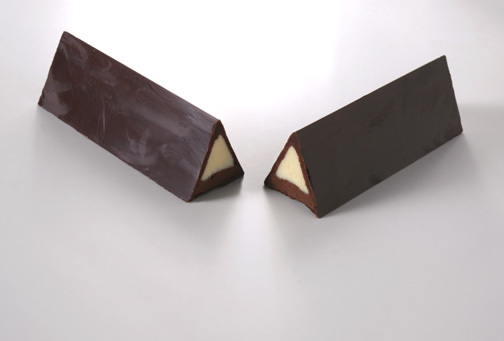 The ultimate chocolate experience presented in a 12-inch dark chocolate bar. Select from various layers of chocolate ganache, nuts, fruit and/or caramel. Weighs approximately one pound. 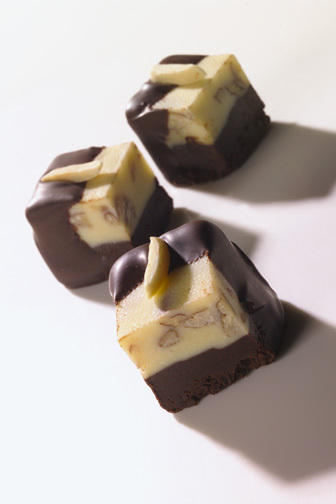 Shown here is a center with white chocolate over Swiss butter caramel over milk chocolate and walnuts. 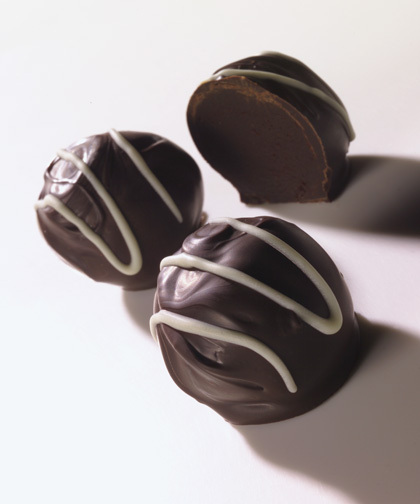 Or choose the simpler white chocolate over milk chocolate center. A unique finale. Perfect for a party. 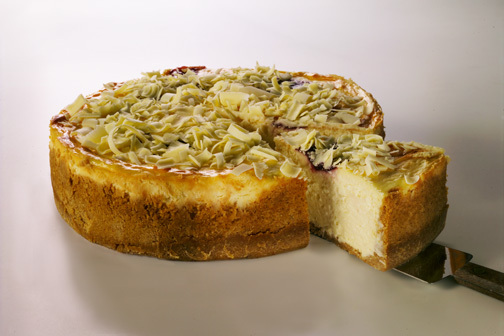 Based on a Parisian recipe, less than one-eighth cup of sugar is added to make this creamy gem, enabling its pure white Belgian chocolate to come forth with the raspberries. 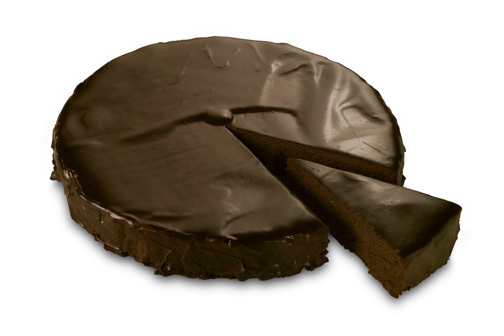 A chocoholic's dream come true, this melt-in-your-mouth luxury is accomplished without flour or added sugar. A special something for someone who has everything. All chocolate and completely edible. 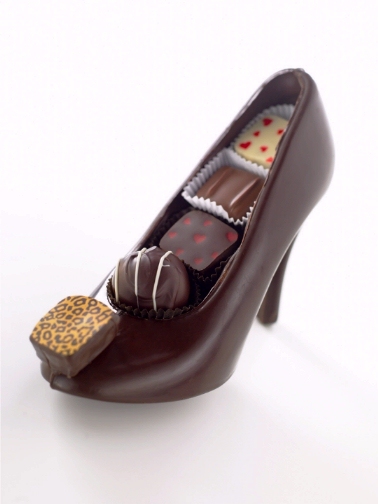 8 inches long, 5 1/2 inches tall with a 3 1/2 inch heel, and full of superb chocolates. Even the leopard print accent is a truffle! Who said chocolate and fashion don't go together? 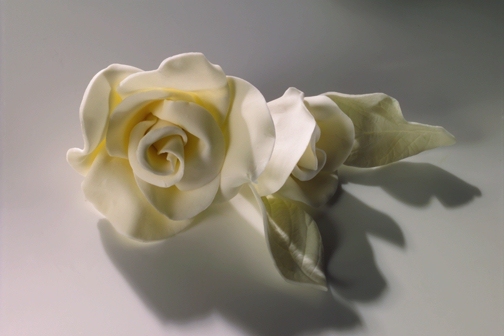 ...and botanically correct chocolate roses and lilies...all completely edible. Check back often for new recipes, party and gift ideas.